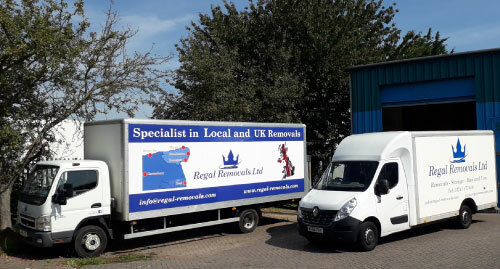 Regal Removals | Secure Storage | Thanet Based. At Regal Removals ltd we believe in having a totally transparent pricing policy. When you call us, we will discuss your requirements and recommend one of the following packages below or suggest a free home visit to assess your exact needs. Either way we will give you a price and stick to it. There are no hidden extra costs. What we quote is what you’ll pay, nothing more! The price we quote you will depend on four main factors. Which vehicle(s) do you need? How many porters do you require? Firstly, we have a 3.5 tonne Low Loader style Luton Van. This vehicle has a capacity of 17 cubic metres or 600 cubic feet. This vehicle is suitable for 1-2-bedroom flats or modest 2-bedroom house moves. The average loading time from a ground floor location with good access and 2 men is approximately 2 hours. Unloading is normally quicker. This vehicle comes with plenty of professional removal blankets and straps to protect and secure your belongings for safe transit. It also has a small light weight sack truck onboard. We also have a larger 7.5 tonne box truck with tail lift. This vehicle has a capacity of 30 cubic metres or 1050 cubic feet and is suitable for larger 2-bedroom properties or modest 3-bedroom house moves. The average loading time from a ground floor and first floor location with good access and 3 men is approximately 3 hours. Unloading is normally quicker. This vehicle comes with plenty of professional removal blankets and straps to protect and secure your belongings for safe transit. It also has a heavy-duty sack truck and a furniture dolly onboard. For Larger 3 or 4 bedroomed homes we can combine the two vehicles to offer a large 47 cubic metres or 1650 cubic feet capacity. We have produced a simple price guide for local work within the East Kent area (Thanet, Canterbury, Herne Bay, Sandwich and Deal) If your move requires us to go outside of this area then these prices would not apply. Long distance work is priced per load and is priced on an individual basis – we aim to be very competitive with our prices for long distance moves so please call us as we would be delighted to help. *1 hour is only available in the Thanet area. All prices are subject to availability and our terms and conditions.